Yesterday afternoon we headed into Newcastle to enjoy an Easter pantomime production of Beauty and the Beast at the Tyne Theatre and Opera House, in the city centre. We had planned on going to the show as a family but my youngest currently has chicken pox so just myself and my two girls (aged 4 and 15) went along to watch the show. The show is from the team behind last years Snow White pantomime at the Tyne Theatre and was starring Bobby Davro at Silly Billy and Dani Harmer (Tracy Beaker) as Belle. We were really looking forward to the show as Beauty and the Beast is both my girl's favourite fairytale. 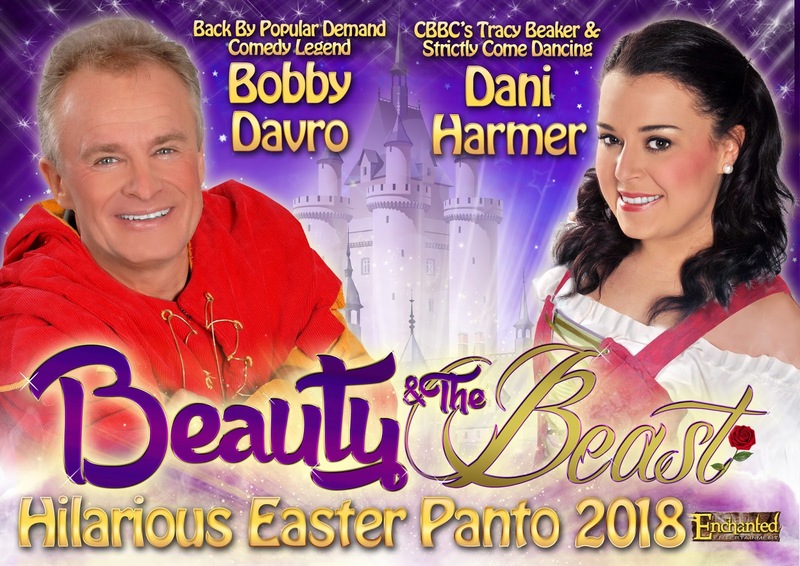 Bobby Davro was a natural on stage and had the audience laughing along from the start, especially the children in the audience. The whole show had a really relaxed feel to it, with plenty of blunders from the cast that they quickly recovered from, lots of audience participation and many laughs. The costumes and stage settings were dazzling and my four-year-old daughter was mesmerised from the very start as there was so much going on from dancing, singing, jokes and twinkling lights. I will be honest and felt like the first half-dragged a little and it did not feature as much of the Beauty and the Beast tale as I would have liked. However the second half more than made up for it and we were laughing out loud, dancing in the aisles and enjoying ourselves so much we did not want the show to end. The fairy was such a great addition to the show and Dame Brenda Brexit had us laughing along. I really enjoyed some of the comedy scenes in the show such as when they did impressions and where they did a song mash-up. There was also some great singing and dancing too with songs that we all know and love and a lovely scene between Belle and the Beast with great lighting effects, which my little girl adored. There were a few moments where I thought I can't believe they said that but it was said in good fun and thankfully went over the children's heads. It was a great panto full of slapstick humour, gaffs, giggles, singing and dancing that the whole family will enjoy. My little girl was dancing in the aisle at the end and did not want to leave as she was having such a good time. If you are looking for something to do today (Easter Sunday) then there is still a few tickets remaining to see Beauty and the Beast at the Tyne Theatre and Opera House at 1pm and 5pm from the box office or the website. I am now looking forward to seeing what the Christmas panto is like after seeing how good this one was. Disclosure we received complimentary tickets to this show in exchange for this review, however, all views are my own.